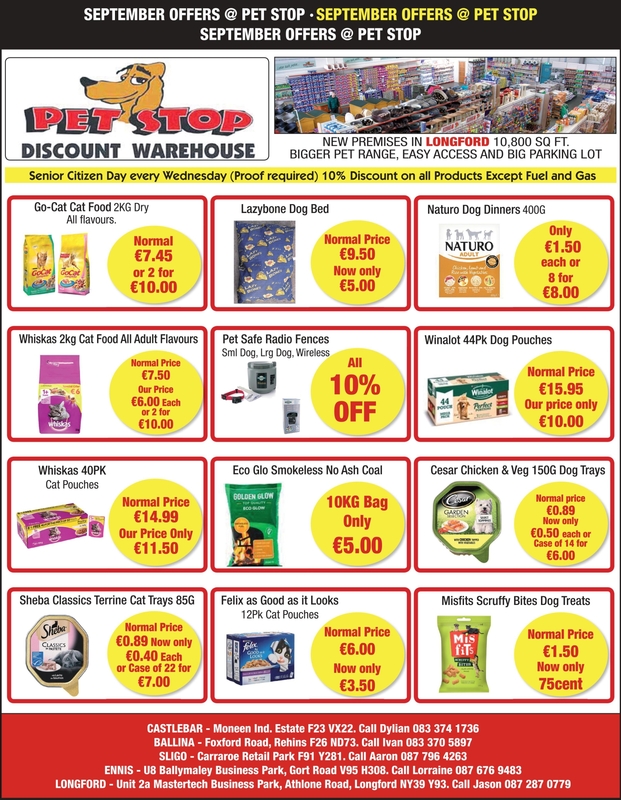 For top quality produce at the most affordable of prices, look no further than the new Pet Stop Discount Warehouse & Fuel Centre in Longford. If you are looking for a one stop for all your domestic pet and equine needs then Longford’s newly opened Pet Stop Discount Warehouse & Fuel Centre ticks all the boxes. The store, which is located inside the Athlone Road’s Mastertech Retail Park in a unit formerly occupied by Toymaster, is a pet lover’s haven thanks to its comprehensive and inexpensive range of products. As well as housing tropical and cold water fish, the store boasts all types of dog, cat, horse, hen, wild bird and small animal feedstuffs. What’s more and what has been the firm’s unique selling point since its inception ten years ago is its enduring commitment to offer customers quality produce at the most affordable of prices. Such is its devotion to that pledge, Pet Stop has backed up that promise over its decade long lifespan by keeping its prices below that of Ireland’s main grocery chains. And the man behind its expansion into Longford certainly had no hesitation in choosing the midlands town to set up base in. “I know Longford well,” said proprietor John (Bob) McKeon, who was formerly the manager of the Longford Town ‘C’ Team. That building Bob makes reference to extends to 10,800 sq metres and with free parking available it’s hardly surprising why the store has already managed to build up a steady trade since its opening three weeks ago. Like any forward thinking retailer, Pet Stop has employed a number of concessionary offers designed to boost footfall figures. At the top of that list includes a 10 per cent reduction for all senior citizen customers on Wednesdays for all items bar fuel and gas products. And, in a further boost, a grooming parlour will be in situ at a date to be revealed in due course. “We will match any online prices that are out there if possible and if we don’t have what a customer is after, we will do our level best to get it for them,” he said. Pet Stop Discount Warehouse & Fuel Centre is open in Sligo Retail Park, Castlebar, Ballina, Ennis and now Longford. So, make a trip to its Mastertech Business Park just off the main Athlone Road this autumn a priority and put Pet Stop’s cost effective and reputation for the very finest in quality to the test. Opening hours are from 9:30am to 6:30pm Monday to Friday and from 9:30am to 6pm on Saturdays. Sunday opening hours are to be confirmed at a later date.